"I borrowed P2,000 from a motshelo and I’ve been paying interest of 30% but at the end of August I did not pay and even this month I won't be able to pay as I don't have money at all. I explained this to the person who borrowed me that I’m not able to pay until end of October as I recently got a permanent job. Now the money is P5712. She is now threatening me that she will report me though I tried to explain my situation. How do I go about this? Is this right?" 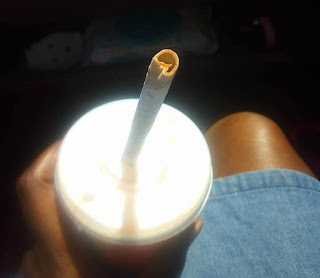 The ban on plastic bags is imminent I suspect we'll also soon have bans on other plastics goods such as straws, bottles, and other forms of packaging. Is this the right thing to do? Yes, it certainly is. Yes, it' will be inconvenient but consider the environment damage. done by plastic products. Something must be done and these bans are a step in the right direction. BUT, what about the quality of alternatives? "I am confident that this issue will be resolved asap and a paper straw that is user friendly will be find very soon. Please bear with us in our process to become environmental friendly. Your input means a lot to us to improve our service." “A person shall not directly or indirectly promote, or knowingly join, enter or participate, or cause any other person to promote, join, enter or participate in … a pyramid scheme”. Longrich is a pyramid scheme. And it gets worse. 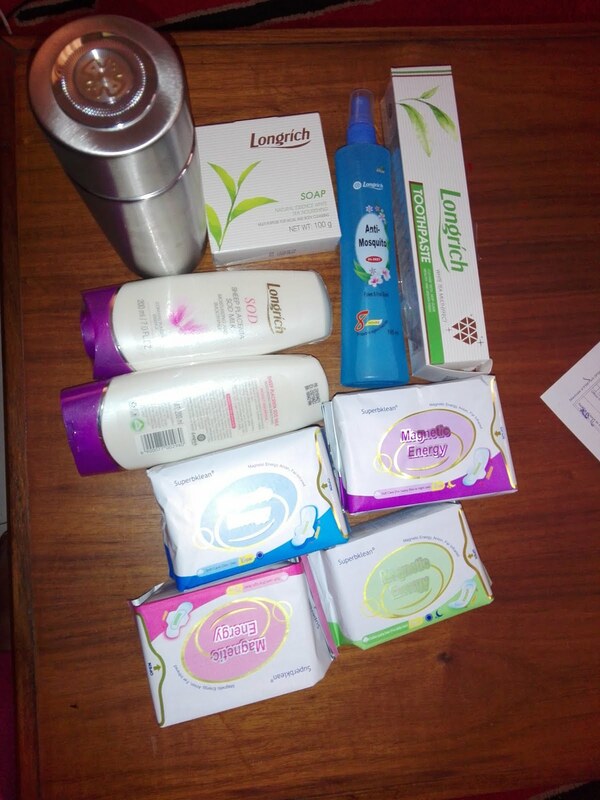 One of the people recruiting for Longrich posted a picture of various products she claimed to have purchased. 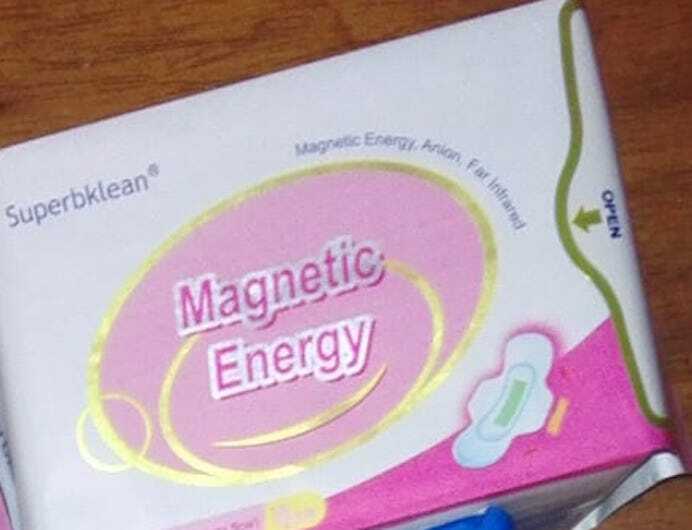 Included in this selection were Longrich's miracle sanitary pads, that appear to offer "Magnetic Energy", "Anion" and "Far infra-red"? "Far-infrared can stimulate local blood circulation and micro-circulation, prevent gynaecological diseases and relieve dysmenorrhea (menstrual pain) by raising the temperature. Far-infrared can prevent and help to treat mens's prostate condition and hemorrhoids; it can absorb foot sweat and eliminate foot odor". This is all pseudoscientific nonsense. Worse still, it's dangerous. Here's some good news. The Ministry of Health and Wellness issued a Press Release. A pat on the back to the Ministry and the Drug Regulatory Unit. 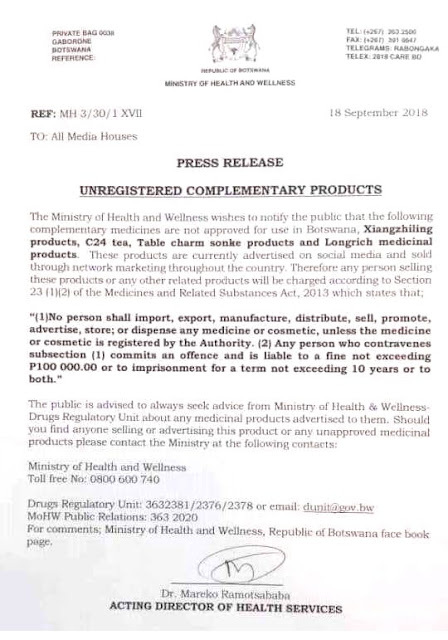 Another pat on the back to the Botswana Medicines Regulatory Authority who are gradually taking over responsibility from the Drug Regulatory Unit. Just as we begin to see the end of the Longrich's products, another bogus products appears. Crystal Cell. 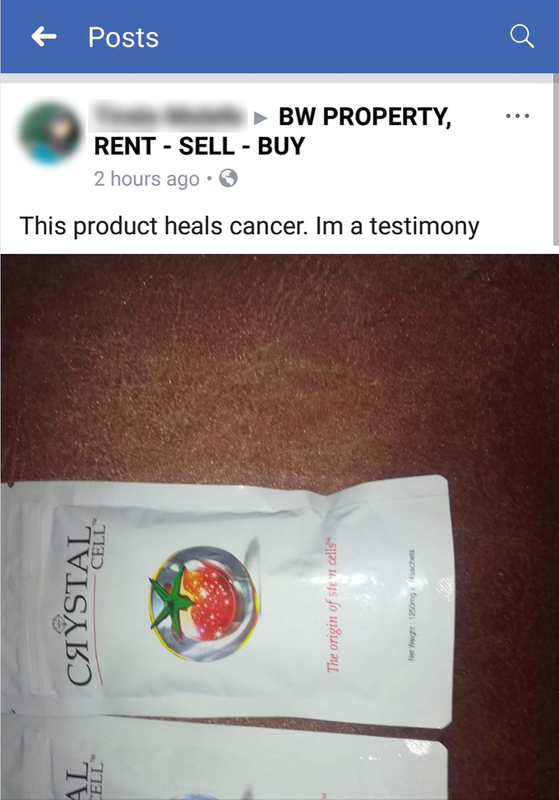 “This product heals cancer.” Really? The people peddling this dangerous product claim that it's based on stem cells. They strongly suggest that it can be "used" with stroke, traumatic brain injury, learning defects, Alzheimers, Parkinsons, wound healing, baldness, blindness, deafness, myocardial infarction, diabetes, cancers, arthritis. It can even be used with "missing teeth"? Are they serious? 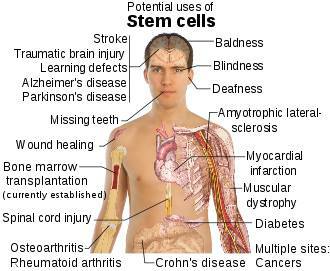 But this is plant stem cells, not human. They can have no effect at all. 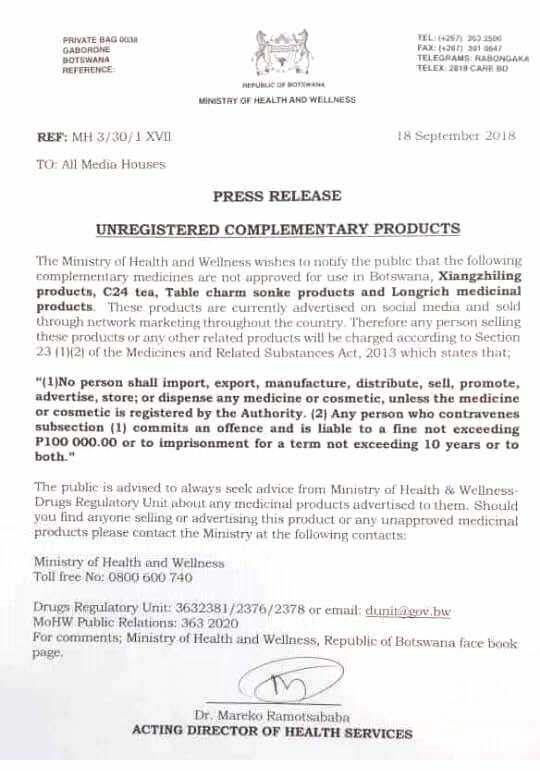 I think the Drug Regulatory Unit and the Botswana Medicines Regulatory Authority will be getting some more calls, don't you?